It’s been awhile since I’ve featured a genre jumper on my blog so today I’m introducing you to Deborah Kalb, who jumped genres to write a middle-grade novel called The President and Me: George Washington and the Magic Hat, released this spring from Schiffer Publishing. 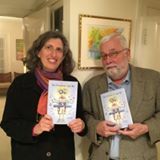 Stay tuned for a follow-up with illustrator Rob Lunsford, one of my coworkers from The Roanoke Times (where, come to think of it, he illustrated some of my stories too.) But first: Deborah! Me: Which came first: fiction or nonfiction, picture book or novel? D: I worked on nonfiction books for adults first, starting with reference books about politics and government for Congressional Quarterly and then writing a book with my father, Marvin Kalb, about the legacy of the Vietnam War, called Haunting Legacy. But, like many journalists and former journalists, I have several unpublished novels—mystery novels, in my case—stuffed away in a drawer! D: I think it was probably a short story I wrote for my high school literary magazine. Me: How is your current project different from other books you’ve written? D: My current book is very different from the serious books for adults that I wrote before—although it does include a lot of history! 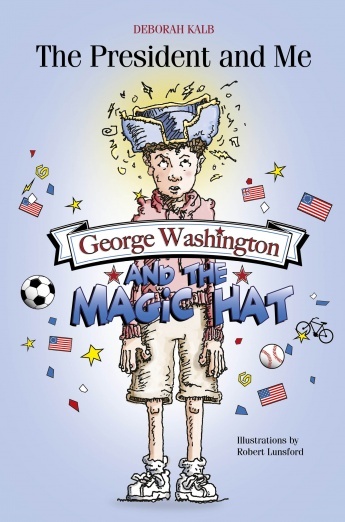 George Washington and the Magic Hat is a middle-grade novel that is the first in a series called The President and Me. It focuses on a group of fifth graders in Bethesda, Maryland, who end up going on some amazing time-travel adventures and meeting the presidents, while also dealing with the trials and tribulations of their present-day lives. It was great to be able to include some humor in my writing! Now I’m working on the sequel, which involves John and Abigail Adams. One of the best things about this project was collaborating with Rob Lunsford, who did the wonderful illustrations. Rob is a long-time family friend—I first met him when I was in fifth grade. Deborah & Rob — post fifth grade! D: It’s challenging to go back and forth, but I tend to do that—I often have a reference book I’m working on, and need to shift gears to get back to fiction. I also have a blog where I interview authors (including you) about their books, and that tends to be so fascinating that I forget to write anything myself! D: Yes, I’d say the common theme involves presidents, in one form or another. Me: What age group do you prefer? D: At this point, middle-grade, approximately age 8-12—but that’s all I’ve done so far in terms of kids’ books, so we shall see… But most of the books I remember best from my own childhood are from that age group. Me: What made you make the jump from writing for adults to writing for kids? D: I thought it would be a fun thing to try. Plus, I have a son who’s currently in fifth grade, so that was an inspiration as well. D: That’s a great question. I think it’s always important to write clearly and understandably, whatever form you’re writing in. And all the researching skills I learned from being a journalist and writing nonfiction for adults definitely were helpful with the historical aspects of George Washington and the Magic Hat. D: Not that I haven’t tackled yet, but I would love to go back to one of my mystery novel manuscripts and revise and update it—I just need to find the time! Thanks, Deborah! You can find out more about Deborah (and lots of other authors, too) by visiting her website. This entry was posted in author interview, genre jumpers. Bookmark the permalink.